Pit bull is the name given to a group of dogs including the American pit bull terrier, American Staffordshire terrier, and the Staffordshire bull terrier. Other dogs are often mistakenly referred to as pit bulls, but only the three named above are officially pit bulls. If you have adopted an older dog, or have a new puppy, you may not know which type of pit bull you have. Distinguishing the pit bulls is usually possible, although some breeds look similar at a young age. Step 1: Weigh your dog. This is only fully accurate on an adult dog, but with a younger dog, you should be able to accurately predict a future weight. American pit bull terriers usually weigh between 35 and 65 pounds. 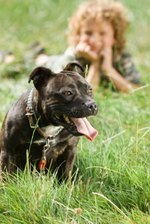 American Staffordshire terriers typically weigh 65 and 90 pounds, and Staffordshire bull terriers weigh from 28 to 38 pounds. Step 2: Look at your dog's build. American pit bull terriers have a proportionate head and body. American Staffordshire terriers have a muscular, square look, while Staffordshire bull terriers have a noticeably broad head. Step 3: Feel your dog's coat. Although all pit bulls have similar coats, there are differences between the three types. American pit bulls have short, smooth hair, while American Staffordshire terriers have thicker hair. Staffordshire bull terriers also have smooth, short hair. Step 4: Compare your dog to pictures online. Most dogs have a variety of colors, so look for dogs of a similar color to your own. If your dog looks like a mix of two breeds, he may be a cross. Take your dog to a vet to establish his age, breed and health. This is important, as it will ensure your dog is healthy, and will give you verified information you can use to insure your new dog.